The village of Orahavo with its small, grass high, hay meadows is enveloped by the shrubby hornbeam forest that is characteristic of the low limestone hills. 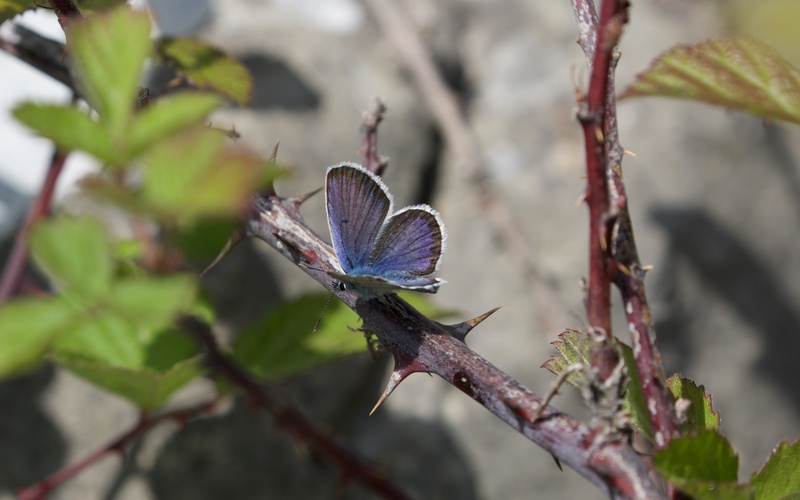 Above, by the side of the winding road to Kucka Korita, there are small glades in the woodland full of plants and butterflies. The breeding birds are quieter now but woodlarks, nightingales and blackbirds still sing from time to time. A honey buzzard glides low over the valley raising its wings and tapping the tips together like a dancer; this is its elegant display flight. 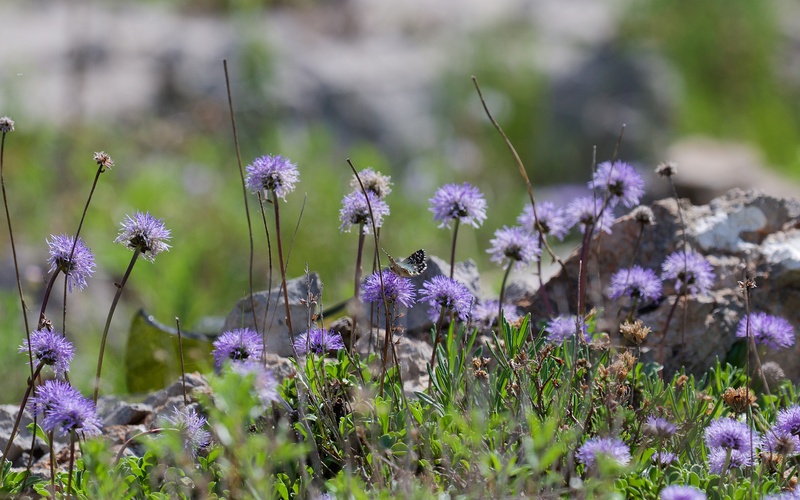 The grizzled skippers (Pyrgus malvae) are common here and sit on pretty Globularia cordifolia, which grows on the limestone everywhere. There are single flowers of a wonderful Geraniaceae species and also a pink crucifer that is attractive and perhaps a Hesperis. Globularia cordifolia with a a grizzled skipper. 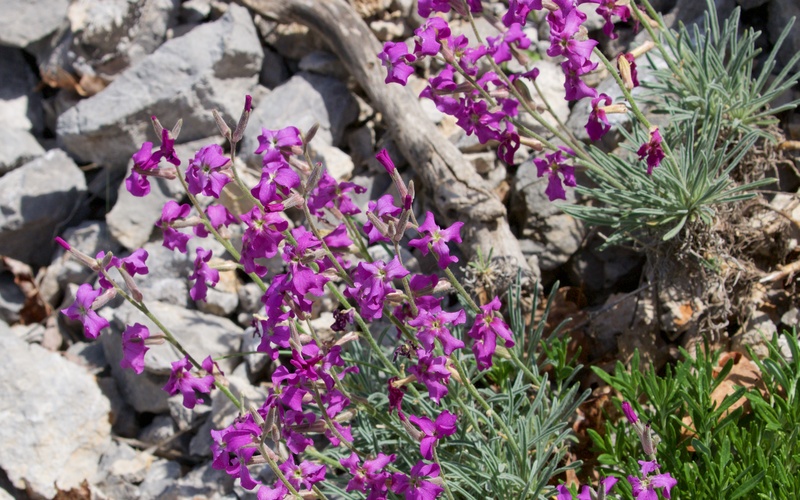 Two unidentified plants: a Geraniaceae species and a Hesperis species. Further up the hill, the beech abruptly takes over from the hornbeam and there are open meadows and tracks leading to juniper and pine clad hills. The fields are a bright yellow, lit by an assortment of plants. 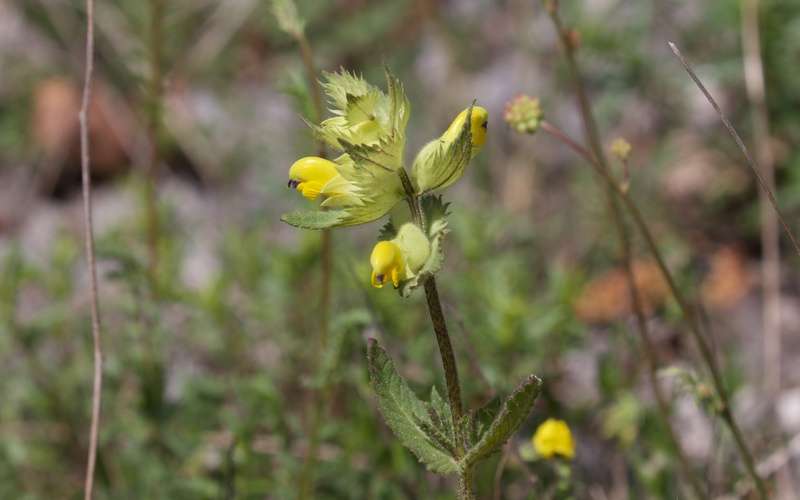 A cow-wheat Melampyrum barbatum is common amongst the grasses and there are clumps of dyer’s greenweed (Genista tinctoria) and patches of Viola arvensis. 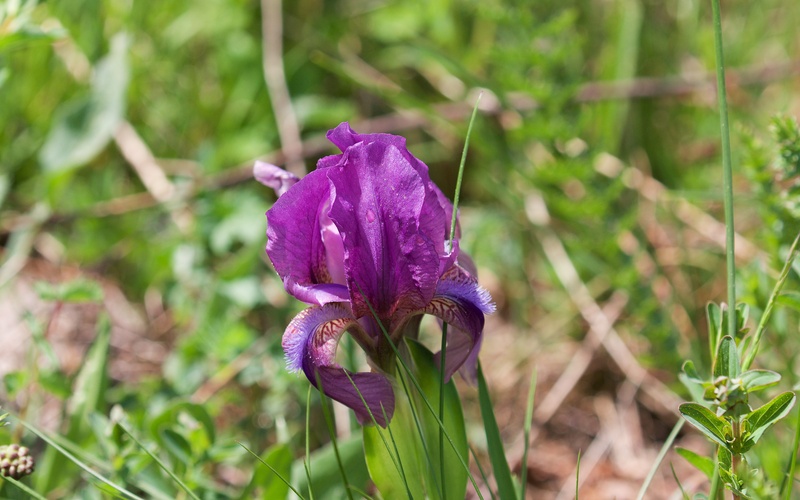 Most captivating of all are large numbers of short, pale yellow Iris suaveolens, of which one in a hundred is a beautiful purple. 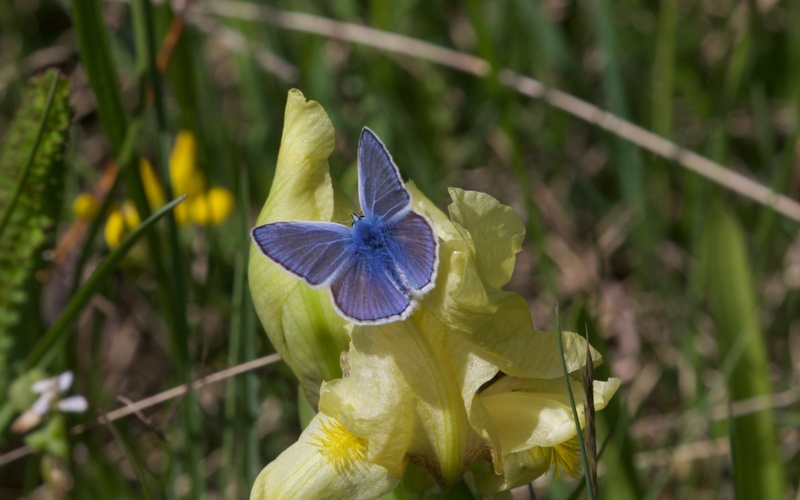 Melampyrum barbatum and Iris suaveolens with attendant Adonis blue. Purple variety of Iris suaveolens. 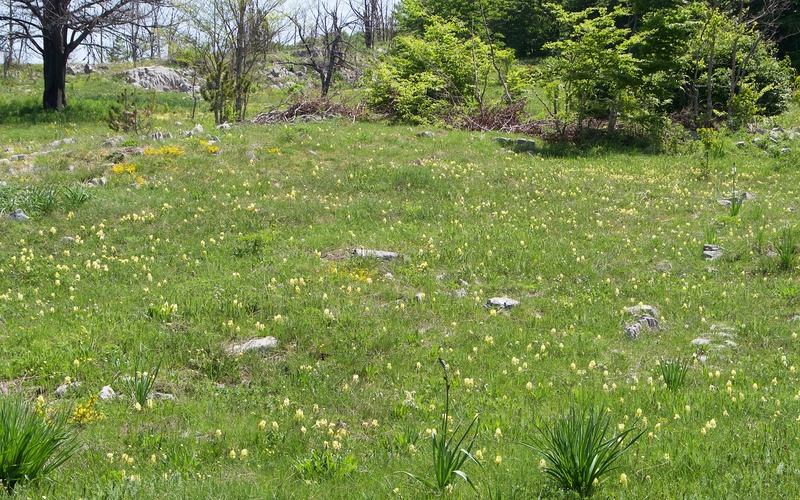 Grass slope dotted with Iris suavolens and patches of Viola arvensis. The tall lily is Asphodel aestivus. 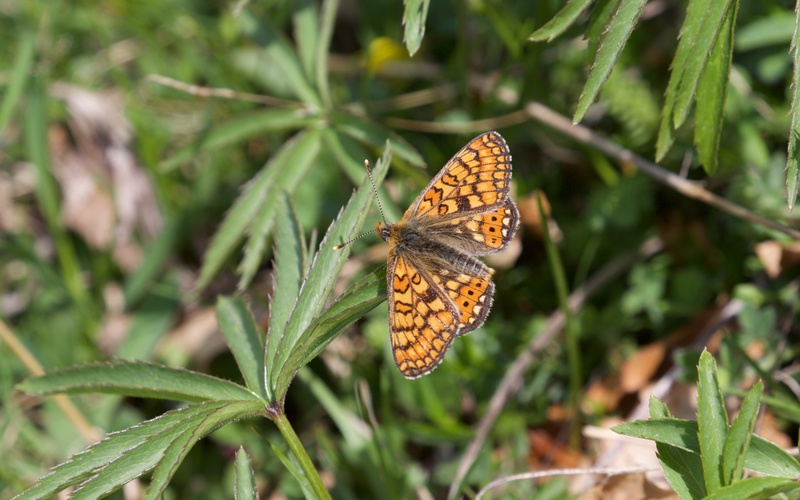 The butterflies are a brown and blue blur with dingy (Erynnis tages) and grizzled skippers dashing low over the road verges everywhere along with Glanville (Melitaea cinxia) and marsh fritillaries (Euphydryas aurinia). 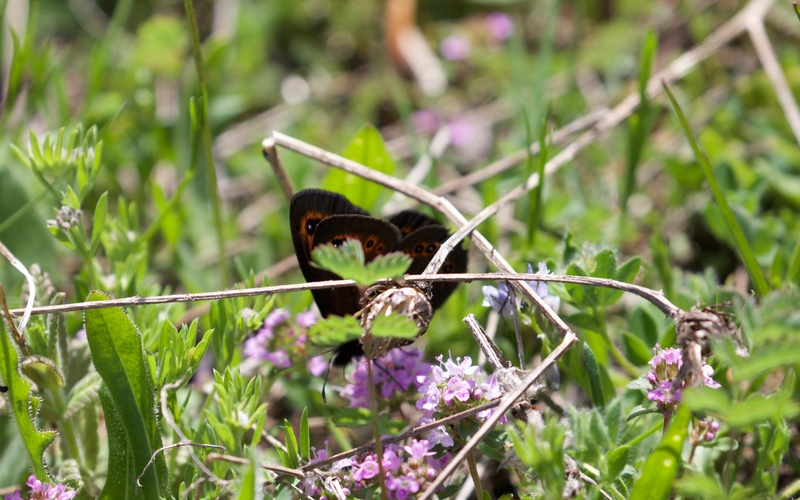 Dark, handsome woodland ringlets (Erebia medusa) rush over the meadows and rarely stop to settle. 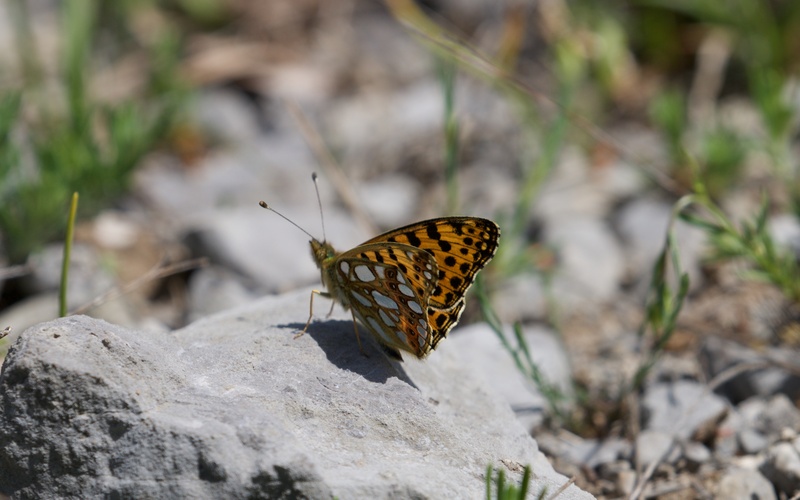 A Queen of Spain fritillary (Issoria lathonia) holds territory over a section of sun-drenched rough grassland. 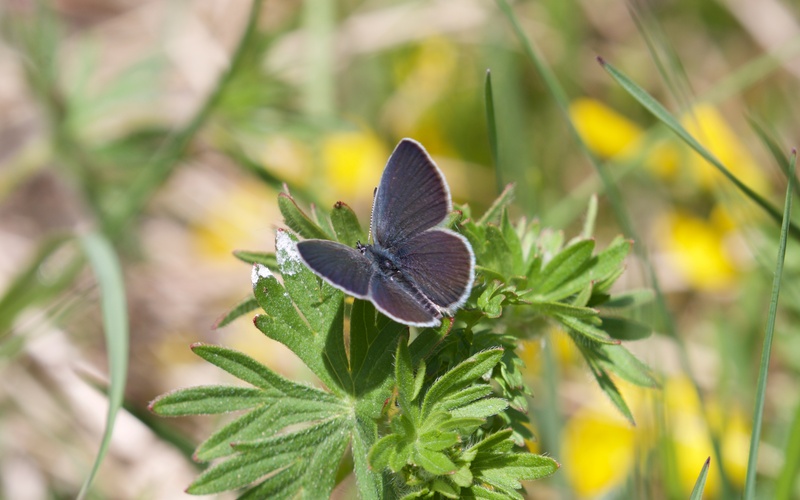 Green hairstreak (Callophrys rubi), common blue (Polyommatus icarus), Adonis blue (Polyommatus bellargus), silver studded blue (Plebejus argus), small blue (Cupido minimus) and I think an eastern baton blue (Pseudophilotes vicrama) are all here too. The Adonis blue likes to settle on the wet mud on the farm track. 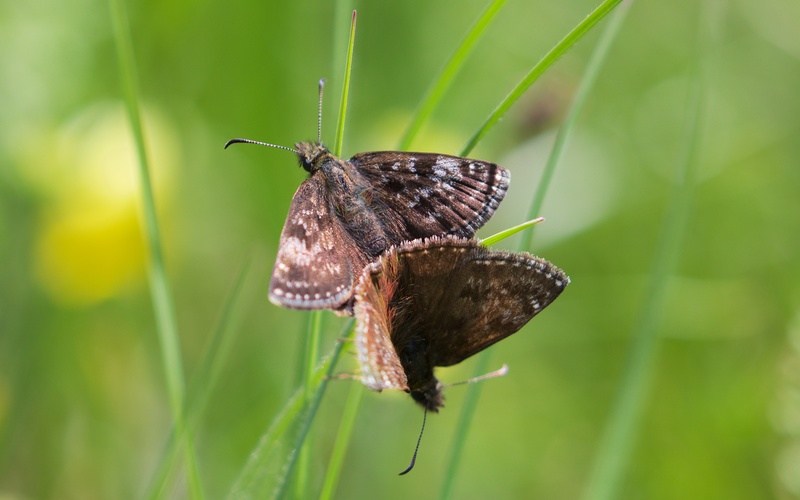 Dingy skipper and a woodland ringlet that briefly stops to take nectar from thyme (Thymus polytrichus). 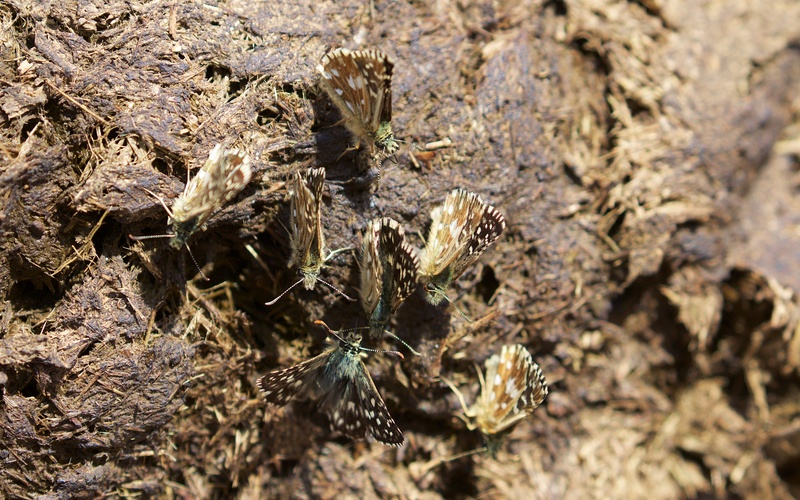 Grizzled skippers on fresh cow dung in the road and silver-studded skipper. 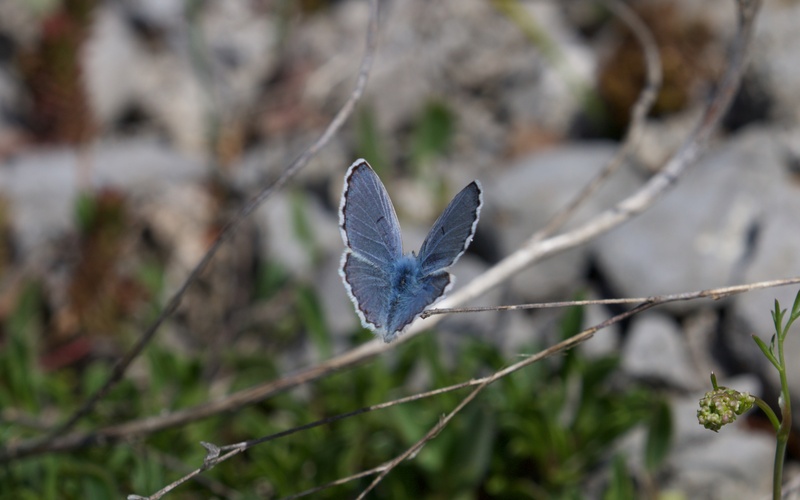 Small blue and, I think, an eastern baton blue. 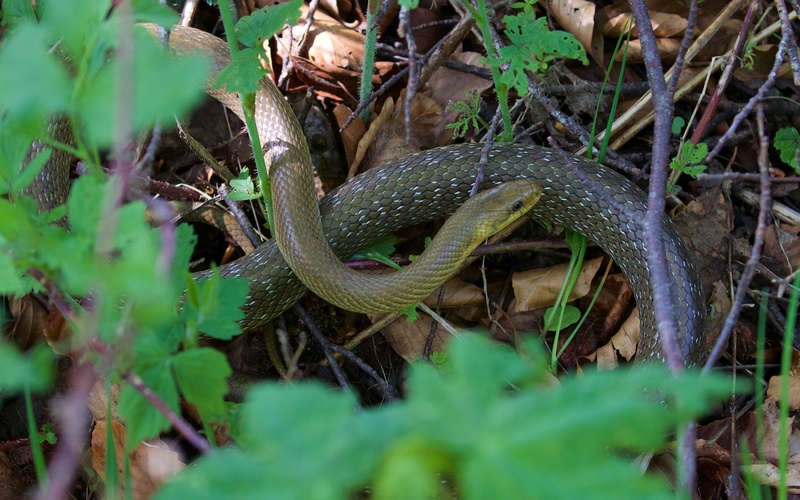 Most memorable of all is a large Aescupalian snake (Zamenis longissimus) that is some 2 m long and makes a rasping sound with its scales as it moves back to the safety of a ditch filled with wood cuttings and debris. The road runs on through the beech then fire-burnt pine and opens up on a high plateau where a loose collection of farmsteads and churches comprise the scattered settlement of Kucka Korita. Here weekend farmers and some that have moved up for the summer months cultivate their plots; on one, there is an entire family working to plant potatoes and onions perhaps before the return down the hill to the heat of Podgorica. The summer farms on the Kucka Korita plateau. 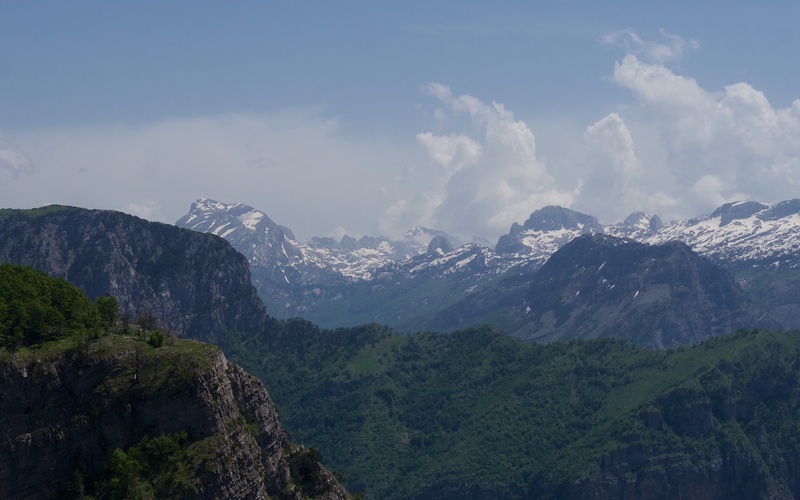 The plateau sits on the edge of the upper reaches of the Cijevna valley with a wide panorama to the east of the Albanian Alps and, beyond them, the toothy spires of the Prokletije mountains. 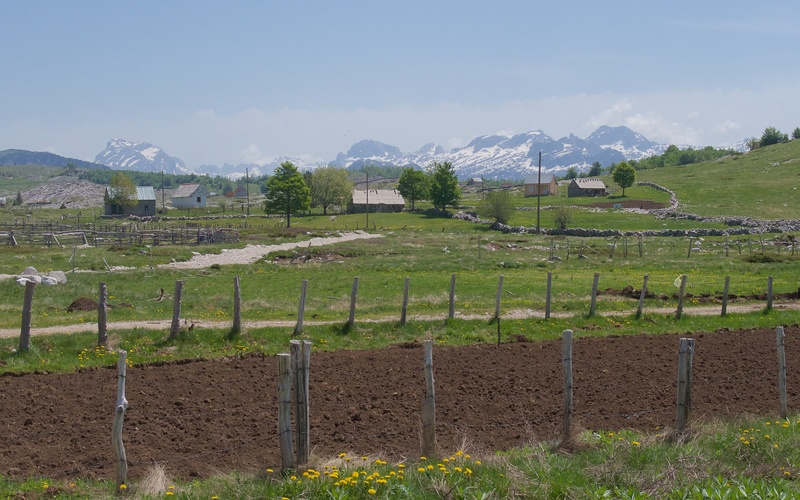 The view from the edge of the Kucka Korita plateau north east across the Albanian Alps with some of the peaks of the Prokletije mountains in the far distance. 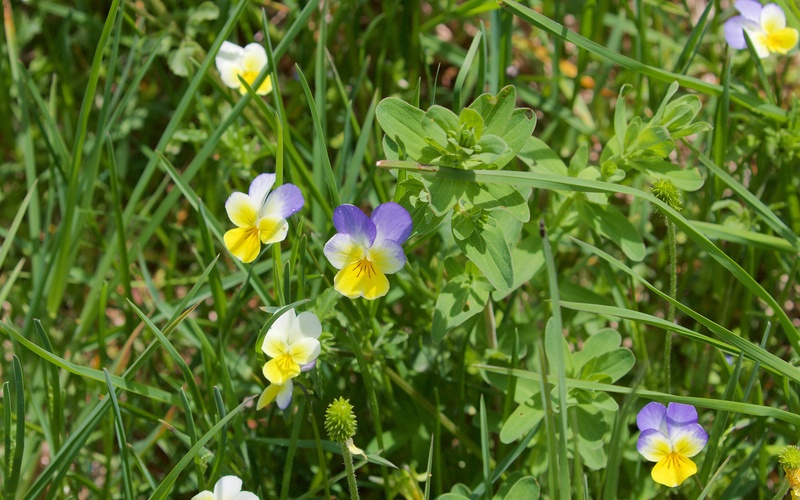 Pretty Viola tricolor, which has multitude of soppy English names, including heartsease, tickle-my-fancy, Jack-jump-up-and-kiss-me, and love-in-idleness is common on the short grass slopes above the village. 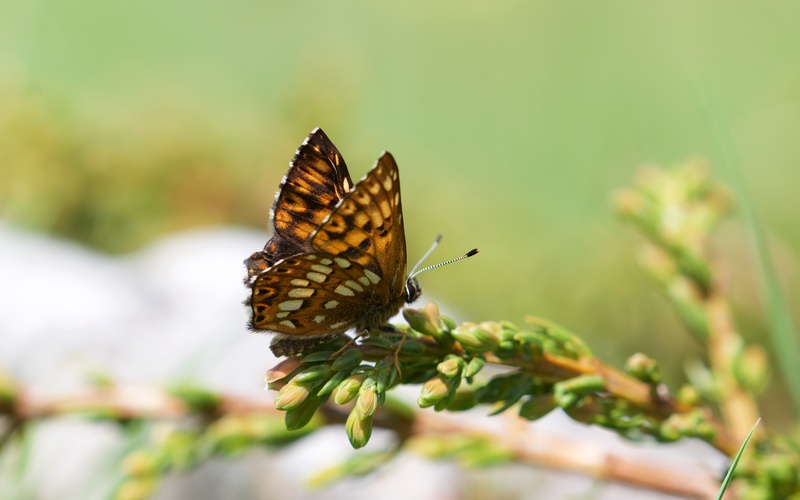 Here too is a small colony of pearl-bordered fritillaries and a freshly emerged Duke of Burgundy fritillary. 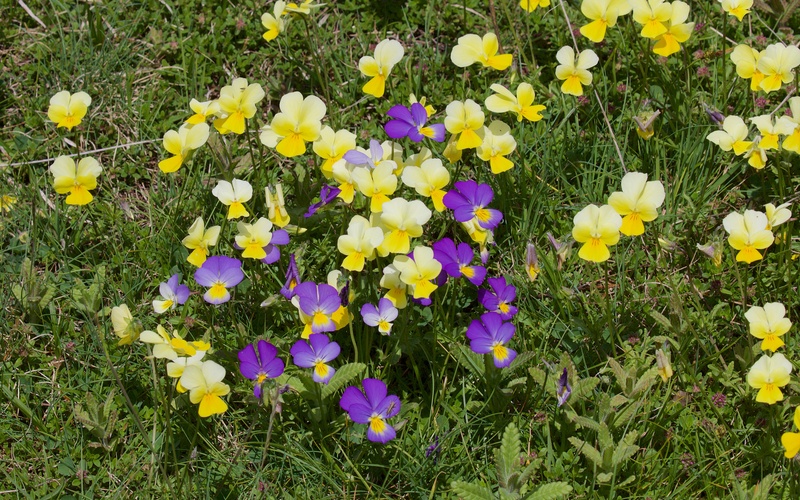 Viola tricolor on an alpine grassland. 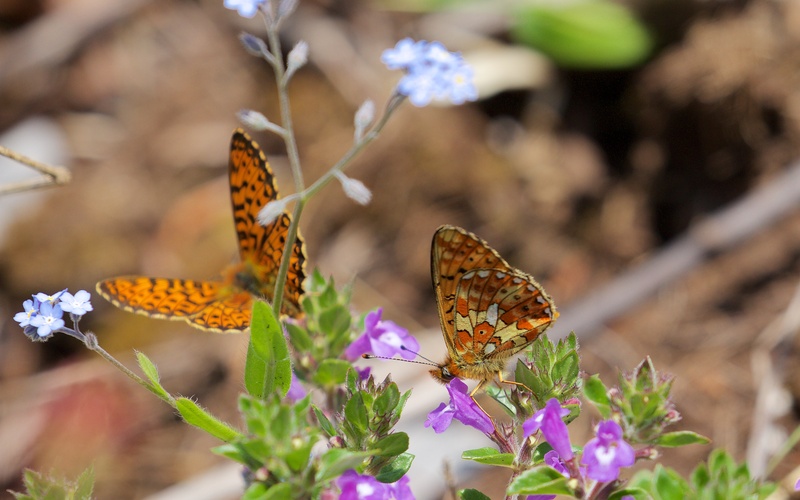 Pearl-bordered fritillary on rock thyme (Acinos alpinus) and a Duke of Burgundy fritillary. 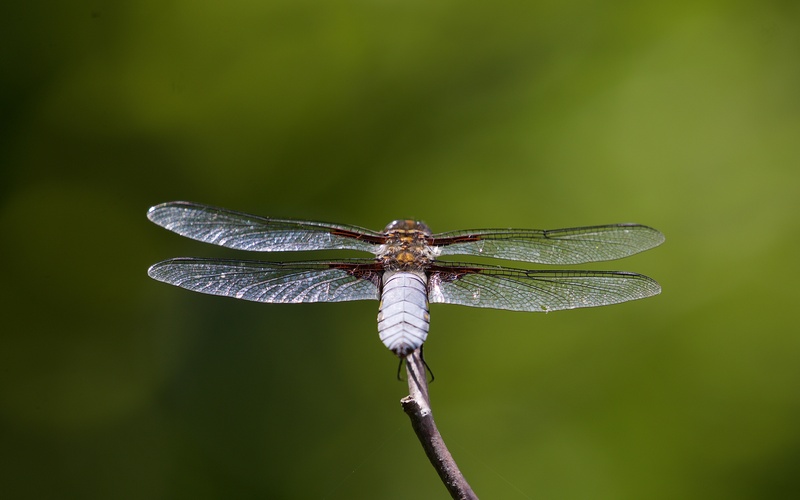 In the beech forest near the cliff edge, a broad-bodied chaser (Libellula depressa) holds territory in a location that is a long way from any open water. A storm gathers over the mountains in the east, moves slowly west and smothers everything in its path. The sunlight is briefly on the hills with dark grey clouds above. I leave the hills with the clouds in pursuit for the sunshine of Lake Skadar but within a few hours the clouds move in and the storm breaks; the evening is dark with torrential rain, bright lightning and cracking thunder but the air cools and clears.